Today’s post is about a frustrating day spent investigating opportunities in Robo Advice and Managed Portfolios that proved just too good to be true. 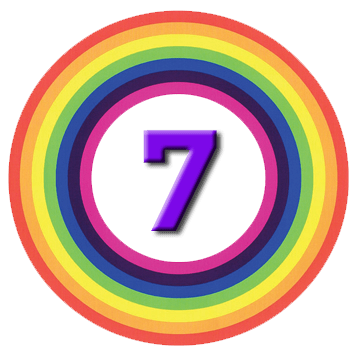 You may or may not have come across optimal stopping theory (OST) before. It tells you how far into a sequence you need to get before it’s likely that you’ve already seen the best example in the sequence that you will see. I came across it when I was looking for a house more than twenty years ago, but it’s commonly used when conducting interviews to fill a job vacancy, or when dating / looking for a marriage partner. In the US it’s known as the secretary problem, but in other parts of the world it’s known as the marriage problem. The theory depends on the idea that you would be able to rank the members of the sequence if you saw them all. You don’t have the time or the patience to see all the possible members of the sequence. In the strict form of the problem, you can’t go back and see a candidate twice – you have to decide at the end of the “interview”. This restriction is similar to the idea that you don’t have time to see everyone. OST tells you how many houses / secretaries / potential spouses you should meet before you make up your mind. The solution is based around logarithms and the natural constant e (Euler’s number, which is approximately 2.718). If there are n potential candidates, then you need to see n / e of them, and then choose the next candidate that is better than all of those. This works out that you need to see 37% of the total, and then choose the next good one. All of which is a long-winded way of saying that I think that by now OST would be telling me to hurry up and choose a robo-advisor. Excluding the DIY portfolios, there are 26 entries in our table of Robo Advisors. And increasingly the new ones we look at are not better than the ones we’ve already seen. Of course, in a way we have chosen our first Robo Advisor, in that we have transferred a pension to PensionBee. But the Robo Advisor problem is more complicated than the secretary problem. We need more than one Robo Advisor (three or four would suit, for diversification purposes). And new Robo Advisors are always being added to the list of candidates. So our search continues past the optimal stopping point. Let’s take a look at this week’s false dawns. First up is the P1 Managed Portfolio service, which was launched this week with the claim that it’s the cheapest passive portfolio in the UK. The total cost is 0.19%. There are five portfolios, arranged according to risk level. Portfolios are rebalanced quarterly to make sure that they still match the target risk level. There’s an ISA, a SIPP and a taxable account available. I’ve never heard of P1, but apparently it was “launched a year ago by James Priday, who founded Prydis Wealth” (another firm I’ve never heard of). We could dig deeper, but sadly, along with the Managed Portfolio charge comes a Platform charge of 0.25% pa (on the first £1M “only”). The combined charge of 0.44% is competitive, and puts P1 in the top section of our leaderboard. But they would need to be a good bit cheaper to overcome my reluctance to place large sums with a firm that I’m entirely unfamiliar with. Earlier this week, AJ Bell announced that the charges on their Managed Portfolios were being cut significantly. The price cuts were timed to coincide with them bringing asset allocation decisions in house. The Portfolio charges would now range from 0.15% to 0.18%, across the usual five portfolio arranged by riskiness. Adding in a Platform charge of 0.18% gives a total charge of 0.33% to 0.36%. There’s an ISA, a SIPP and a taxable account (increasingly referred to as a general investment account or GIA). This is extremely competitive, and given that 11.8% of my net worth is already with YouInvest, this price cut would be very welcome news. But of course, there’s a catch. The Managed Portfolios are only available on AJ Bell’s Advisor (IFA) platform. Private Investors don’t get a look-in, unless they go through (and pay) an IFA. We are stuck instead with the YouInvest Passive funds. These charge 0.50% pa, plus a platform charge that has been waived until 2019. So the real charges are in the 0.68% to 0.75% range. I’m more angry about this differential than I expected to be. I already had plans to reduce my allocation to YouInvest below 10%. But now I am strongly motivated to replace them entirely if I can find better alternatives. 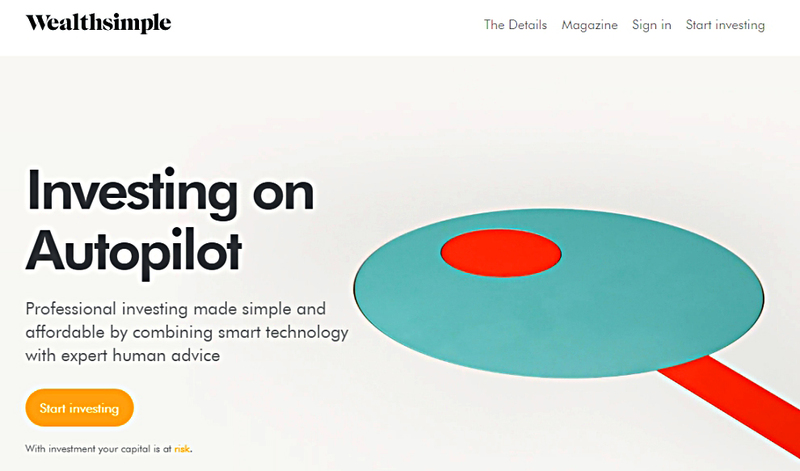 Our third candidate is WealthSimple, which arrived in the UK from Canada with a SuperBowl ad. There’s a nice website, too, and apps for Android and Apple. WealthSimple already operate successfully in Canada and the US. They have 40,000 clients already, and manage £750M. They are backed by Power Financial. I hadn’t come across this company before. But they are apparently the number five robo advisor in the US (behind Vanguard, Schwab, Betterment and Wealthfront). They are offering ISAs and GIAs at the moment (no SIPP). There’s a minimum investment of £5K, and this is managed for free (for a year at least). 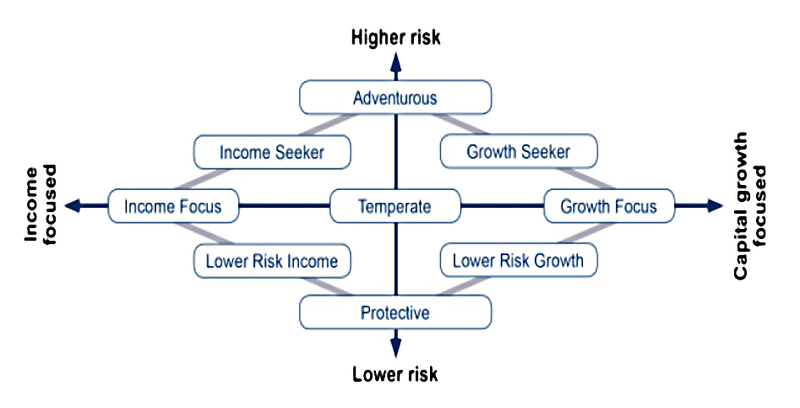 There are three risk levels – conservative, balanced and growth – and a risk questionnaire to point you towards the most appropriate one. There’s not much detail on the makeup of the portfolios (at least not without signing up). They also say that the portfolios will have a social responsibility focus (SRI). This seems to mean low emissions and “good” employment policies, but no guns or tobacco. According to Triodos Bank (not an uninterested observer) 62% of UK investors are interested in their money making a positive contribution. But SRI portfolios are by definition restricted, and so are potentially more risky and / or likely to produce lower returns. 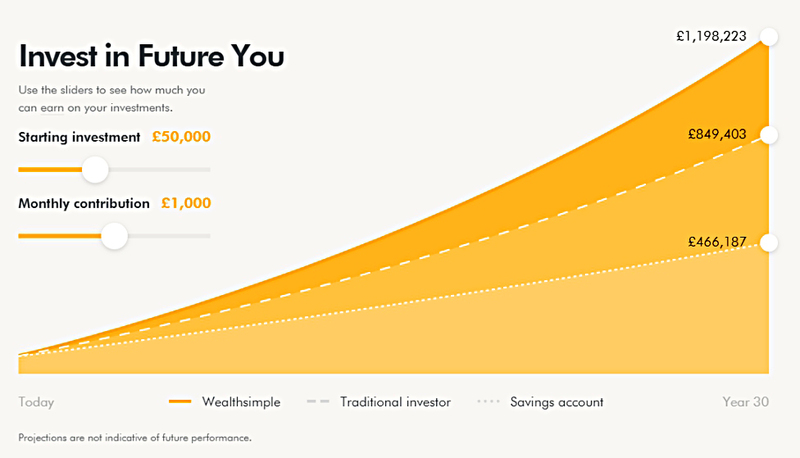 If you invest £100K or more, you become a member of WealthSimple Black. As well as a lower fee (0.5% pa versus 0.7% pa), this comes with advice and travel perks. I’m not sure what kind of advice this will be, but there is definitely an advice gap for smaller investors in the UK. Unfortunately, the WealthSimple fees don’t include the underlying fund management (ETF) fees – always check the small print. This adds another 0.2% pa, taking the minimum cost up to 0.7% pa, from £100K upwards. Their projections tool makes it clear that – like most robo advisors- they are competing against cash savings and expensive traditional investment platforms. And their social responsibility tilt (and their SuperBowl ad) shows that they are focused on millenials starting out with investment, and not grizzled DIY investors like me. We looked at three providers, one of which is restricting their offer, and the other two of which are more expensive than they would like you to believe.